Imagine being able to hold your card deck in your hand, and LEVITATE it right off your palm! Or how stunned your spectator will be to see his signed and torn card restored by you, right before his eyes? Or best of all- picture yourself being the master of some amazing, shock-producing, reputation-making- but little known card moves, techniques that will put you head and shoulders above the other magicians! 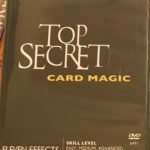 Top Secret Card Magic will get you to that level, and FAST! The step-by-step, crystal clear instruction on this DVD is a delight to watch and to follow. Bring your card magic up a notch! SIDE STEAL DROP – New card move that fools magicians!